Visit the following site for a detailed explanation for each. In this unit, explore how people perceive images in an effort to develop graphic designs that have a more powerful impact on the viewer. The next step is to familiarise ourselves with the tools of the graphic designer. We will begin with Adobe Photoshop. The challenge below will be a fun way to get to know some of the more common tools in Photoshop. Take a picture of yourself. Next, gather a few pictures of some interesting objects whose shapes are similar to some of your facial features (i.e., slices of fruit and vegetables etc...) Then, using Adobe Photoshop, put them on your face. Your final image should be 400 x 300 pixels at a resolution of 72dpi. This exercise will require you to demonstrate an understanding of a variety of selection tools (i.e. crop, lasso, magic wand tools in Photoshop), layers and image resolution. Post your final image to your Technology blog with a brief written explanation about the steps you went through in the process. Hanoch Piven is an artist who makes silly portraits like the ones you will be making. 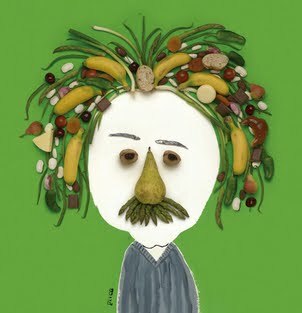 While he uses real fruits and vegetables (and all sorts of other objects) in his work (as we see in the above portrait of Albert Einstein) rather than a sort of digital collage like we are doing, the idea is the same. Notice that he chooses the pieces very carefully to emphasise characteristics specific to the individual. You are encouraged to take a similar approach. Choose objects for your collage that say something about you. Along the way, you will use your developing understanding of the principles of design to make improvements to ensure that your design has its desired impact. You will justify your choices based on specific research and analysis. Write a paragraph that details what this project is all about. What is the problem/issue that has inspired your project? Why did you choose to solve the problem? Who is the intended target audience? What needs will your work fulfil when it is complete? Write a short paragraph outlining some of the most important things that you learned while working with Photoshop. For example, an important concept is the idea of working with layers. Can you think of any others that you learned? How do each of these things help improve your workflow? Now think of some things that you still want to learn to do. How could you go about learning this? Be specific and give sources. In your own words, summarise what you have learned so far about the principles of design. Provide concrete examples to illustrate. What do you still want to know? Where will you look to find answers? In this unit, will have a look at the work of other artists and designers to develop a deeper understanding of the different design elements and how they work together. We will try to see how they use shape, space and colour in different ways to get a desired effect. Find 3 or 4 products that are related to your own project and provide an analysis of the use of different design elements in each. You should explain what you believe the artist/designer was trying to communicate and whether or not you feel that they were successful. Justify your point of view with evidence and specific reference to the artwork. You should make specific reference to the principles of design and Gestalt laws of perception that we have covered. What sort of product do you intend to create? Why have you settled on this particular solution? Next, follow your design brief with a short paragraph that elaborates on your idea and explains the process you went through to come up with the idea. What sort of brainstorming did you do? What other ideas did you have that didn't make it? How were you able to use feedback to help you make your choice? Images should be no less than 300dpi to ensure quality. In this section, you will develop 3-4 possible designs for your project. Each possibility should consider things like layout, colour palette, fonts, images, hierarchy of information etc... Once again, this section will be a little bit different for each of you, depending on the sort of project you are working on. You are well advised to group yourselves together with others who are working on similar projects. Prepare your 3 or 4 possible designs and present them in your online process journal with brief explanation of the strengths of each. Your analysis of each one should make specific use of the principles of design that we covered at the start of the unit. You will need to get some feedback from members of your target audience to help you finalise your decisions. You may choose to do this activity on paper, in which case, you will need to scan your images to a computer to put into your process journal. Otherwise, there is a wide variety of simple sketching programs for your computer that you may want to check out. Look at each of your designs again and measure them against the design specifications. Use the feedback that you got from members of your target audience. Make your decision about which design you want to go ahead with and write a short paragraph to justify your choice. Now that you have made your final choice, you need to create a more detailed layout design. Think of this as a planning step to get you ready for the next phase, Creating the Solution. For example, if you were working on a poster, you would include specifics about as what content will go in which spot. What sort of pictures do you want here and there? Let's say that you want a picture of so-and-so riding a dragon, then this step will help guide you to collect and shoot the images that you will need (i.e. the dragon, a picture of the person who will be riding it, posing appropriately) for when it's time to create. If you have done a good job investigating, designing and planning in the previous two phases of your project, this part should be fairly straightforward. All of the important decisions have already been made and it is just a matter of putting everything into place. With any luck, everything will go according to plan. Of course, things don't always go according to plan. In your process journal, you will document the tools that you used and what you did at each step as though you were writing out a set of instructions (think about the projects that we looked at on the Instructables and Makezine websites.) Include any suggestions you have for your readers (i.e., the right sequence to do things, good places to find royalty-free images and fonts) and be sure to describe and fully justify any changes you made from your original plan from the Designing phase.